We had a serious problem – we hadn’t done any washing in around 3 weeks and we’d pretty much run out clean clothes to wear. 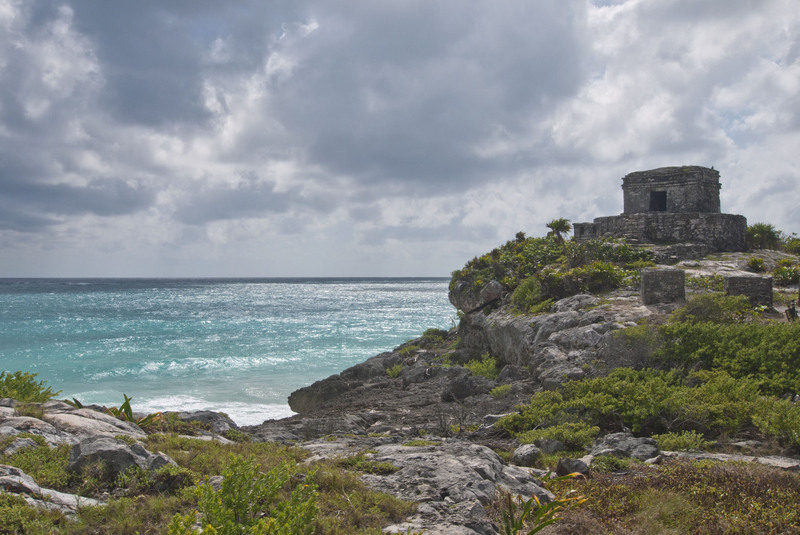 We decided to drive down to Tulum to find a laundry and go to visit the ruins at the same time. Its only about 40k down the road and we got there fairly early before we realised that it was Sunday and everything was shut – you can lose track of days really easily when travelling. 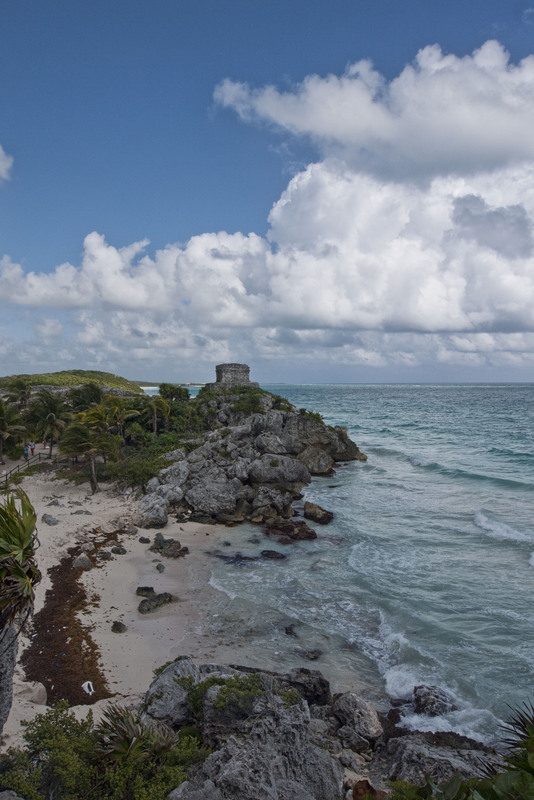 As we’d have to wait until the next day to get our washing done we decided to spent the morning checking out the ruined Oceanside city of Tulum. 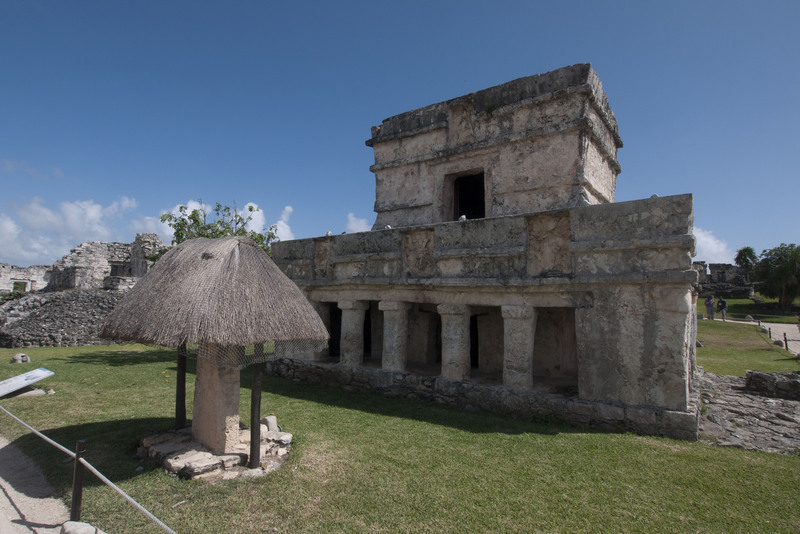 Tulum was built in the Late Post-Classic period so is younger than most of the big cities that we have seen having only been started after 1200 AD. However this meant that it was still in use when the Spanish arrived in the early Sixteenth century. 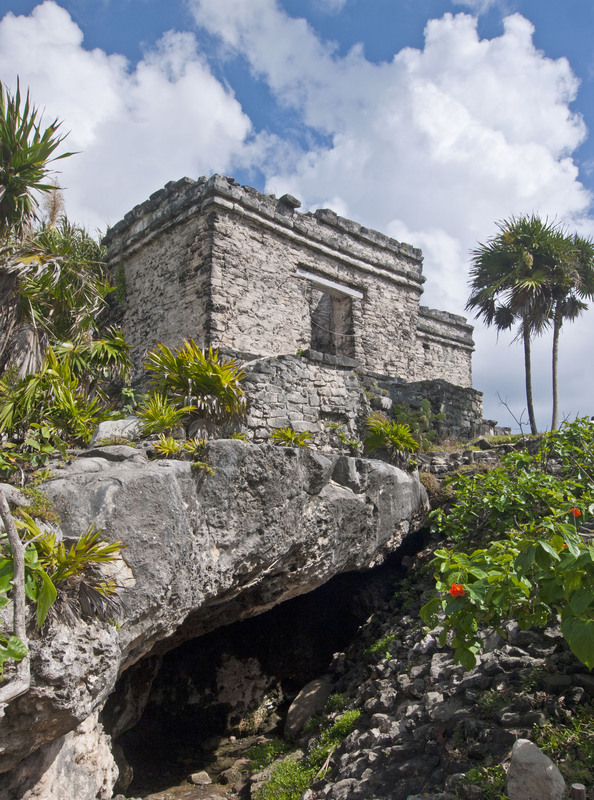 The site continued to be used even into the Caste Wars of the 1890’s when Mayans held the site against the Mexican Army for over 25 years. To be honest the ruins aren’t that great – there aren’t any towering temples or massive acropolii but they city is built on cliffs overlooking the Caribbean and has a stunning outlook. The ruins even have their own beach which seems to get ridiculously crowded with tourists. The weather was really hot so by the time we’d walked around the site we were ready for the beach. We drove back up the coast a bit to a place called Xpu-ha which has a couple of small guest houses on the beach which allow RV’s to park. We spent the afternoon on the beach and in the water. The next morning we were up early to get back to Tulum and get our washing done – oh the excitement of the travelling lifestyle. We found out that our washing would take until 6pm that evening so we were stuck in Tulum for the day. Sometimes the most unexpected things are the best when you are travelling and so it turned out today. We decided to go to Gran Cenote first thing. This Cenote was amazing. At first glance the cenote didn’t look much but once you were in the water and snorkelling round the edges you realised that there were some amazing caves hidden under the edges of the rock. One in particular was a great big cave with some serious decoration in the form of stalactites. There was also a 2nd cenote linked to the first by a tunnel. The second one was very shallow except the water dropped off round the edges into deep caves. Snorkelling round here I found a big freshwater turtle but it wasn’t really interested in hanging round ! After spending a couple of hours and Gran Cenote we drove to another Cenote – Casa Cenote which was a couple of miles down the road. 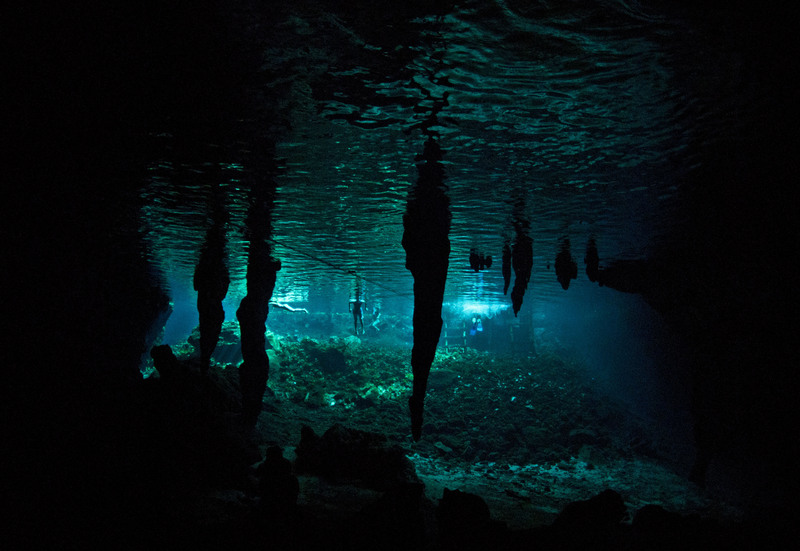 This Cenote is very different in that it looks more like a river than a cavern. However it is only 20m from the sea and at the seaward end there is a deep cave that looks like it leads out to the sea. 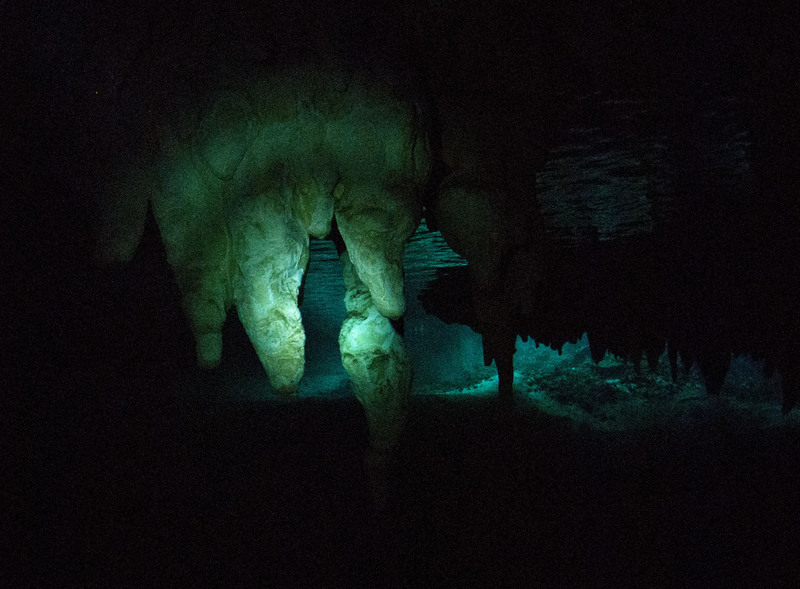 The water in the cenote was brackish so there is obviously a link to the sea. 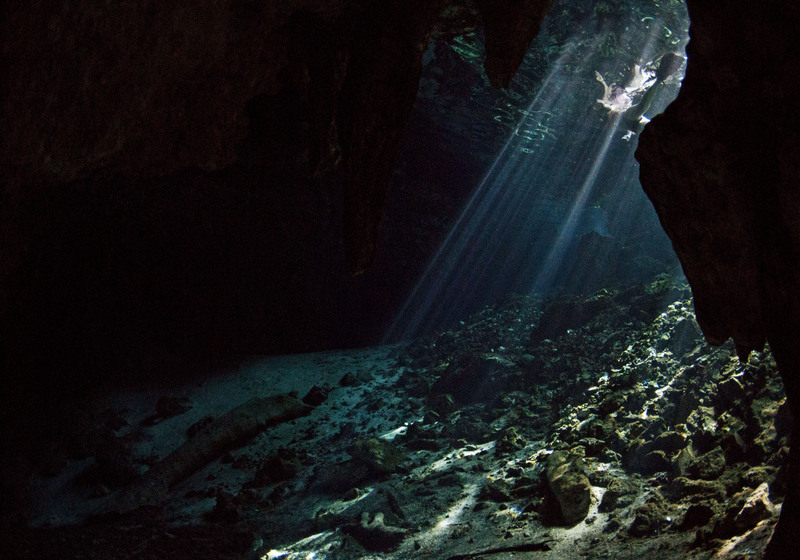 The cenote itself is quite long and is actually a number of collapsed cenotes which have all merged together. 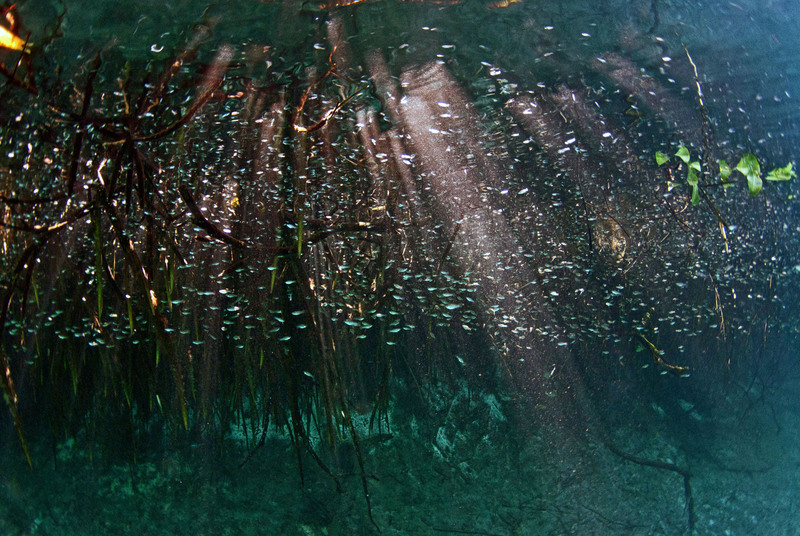 There are mangroves lining the sides walls of the cenote which are home to thousands of juvenile fish. 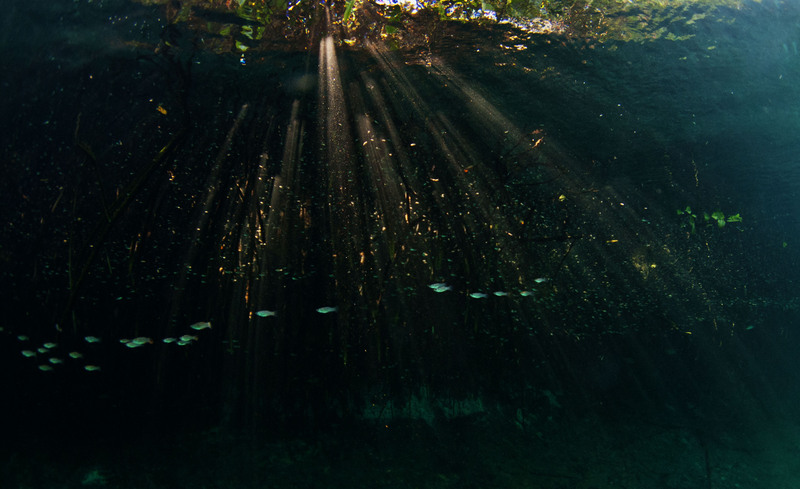 This in turn has attracted some predators both in the form of birds and fish to the cenotes. 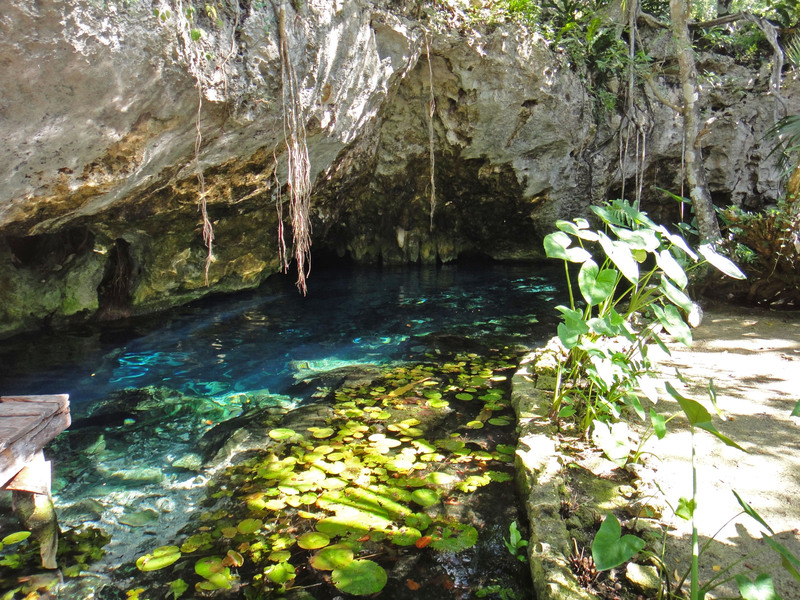 Swimming in these cenotes was really different to the ones that we dived in and really good fun. 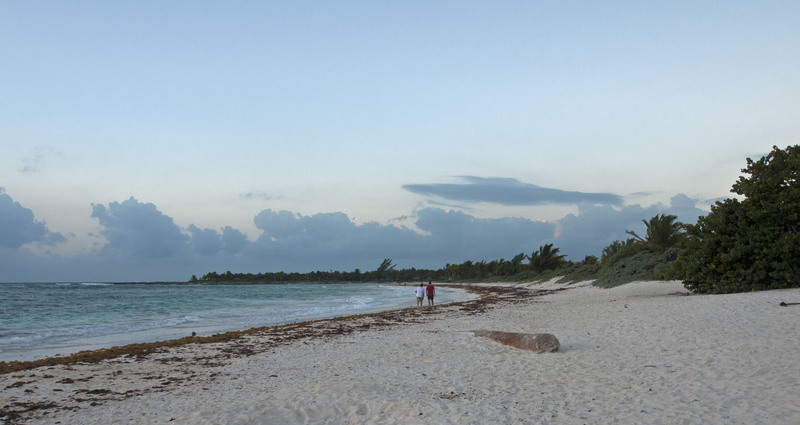 We decided to find somewhere in Tulum to spend the night so drove down the beach road. At the end of a short but rough track we found a little beach bar that also does camping. 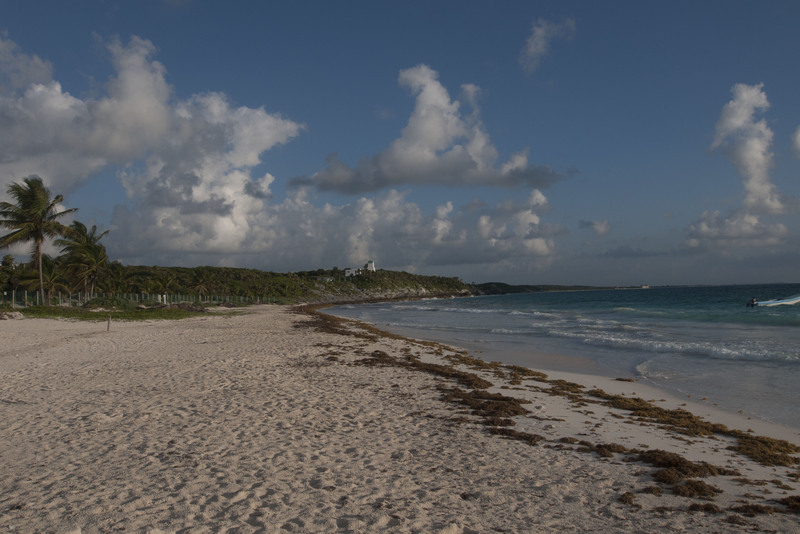 The Tulum beach is gorgeous and so less poncey than further North. 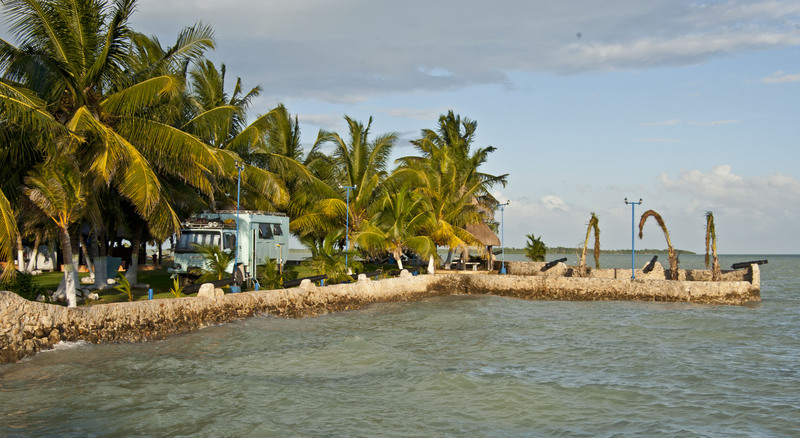 If you are looking for the “real” Yucatan then head down here – its also way cheaper than further North. After we finally got our washing back we set out for Belize. It’s fairly long drive to the border though so we stopped off at Chetumal in one of nicest campgrounds we’ve been too (Yax-ha). We parked right on the sea along a sea wall with an orderly row of cannons on it. There was a swimming pool and a nice restaurant. We could have stayed here longer but the road was calling.